My baby has a black eye. I mean that in the literal sense, not that his reputation was besmirched or anything like that. I‘m told that he climbed onto a basket (toys are kept in plastic baskets at daycare) and fell off the basket, face-first onto a block. Apparently there was blood and crying. Daycare called my husband, who went there and checked on Punkie. Then my husband called me and told me what happened. He also tried to warn me that he seemed alright but it looked bad. I know getting a shiner was very painful for Punkie and being injured for the first time (aside from a couple of bruises) was probably very scary for him. But he’s okay now. He was a little clingy for a few days, but he really is okay now. Now that I know he’s okay, I can admit that this whole episode was very upsetting to me, on several levels. First, my baby was hurt. I regret very much that someone else, not me, was there to comfort him and clean him up. This is a really emotional thing for me, I guess. Second, I didn’t know until my husband had gone to daycare and then called me. So, the kid’s mother is the last one to know that Punkie is bleeding from the eye. We had considered this type of situation when we chose this daycare. We knew that this daycare was highly recommended and that it was very close to one of us during the day and that one of us could be there quickly if needed. It all made such logical sense in the abstract. When Punkie hurt himself, everything went as we had planned . . . and that, it turns out, feels terrible. Three, I can’t stand that I’m so upset with myself over this – the kid is fine. For real. And here I am, three days later, still stewing over it and whining on my blog. Look at the photo I posted above – he’s smiling. That photo was taken 3 hours after the injury happened and he’s smiling. How serious could the injury be? Serious enough to make me a nut case, apparently. Oh, but why is he smiling, you ask? This brings us full circle to my first point – he’s smiling because his mommy (me) picked him up from daycare that day and he wanted nothing more than to be hugged and held by her. And I wasn’t there when it happened – someone else was. Someone who doesn’t love him cleaned up the blood, held ice on his face, and snuggled with him. The good news is that he’s okay now. He has a shiner that my dad can have a good laugh over (“[Punkie] is a boxer for Halloween,” “you should see the other guy,” etc.) and it’ll be a topic of fond conversation in the (distant) future, when we all look back at the photos from my sister’s wedding and see a smiling, black-eyed baby in a bow tie. 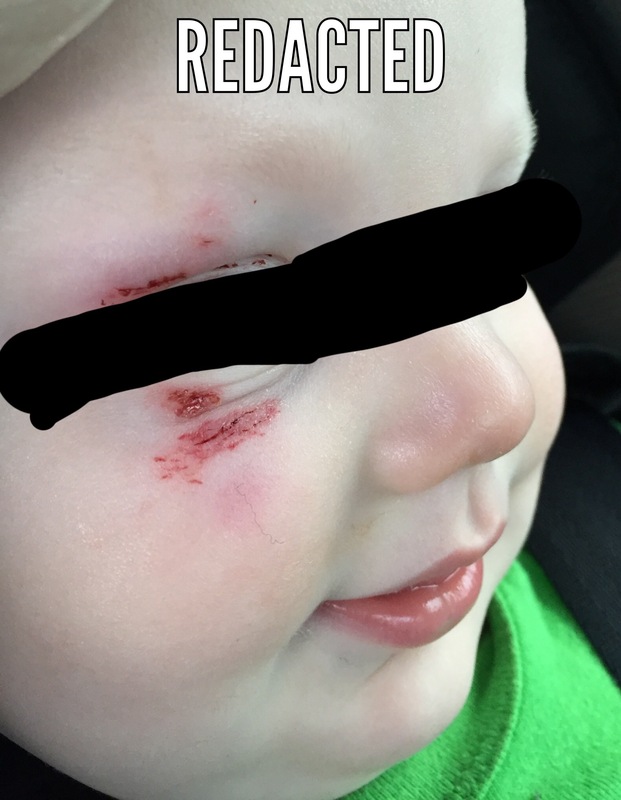 This entry was tagged baby black eye, baby injury, baby shiner, daycare, lawyer mommy, mommy blog. Bookmark the permalink. Oh no mama! I hope you heal as quickly as Punkie. When my little guy was almost two, I took a ladies weekend with my mom and sisters-in-law (about two hours from home). My husband took the baby to my parents’ house (about two hours in the other direction from home) to spend time with Grandpa. When I arrived back home on Sunday, I hopped out of the car, so excited to see my guys, and my husband’s face crumpled. Our little one had broken his leg on a slide the day before! My husband, my dad and my brother all trucked the baby over to the ER, sat through appointments and cared for him that night. After consulting with several nurses, who were also mamas, he decided not to call and ruin my weekend. This parenting thing, especially the full-time working mama thing, is so hard. And also, so awesome. I made a decision early on to let go of any guilt that might come with the career business. Because I know in my heart that I am a good and caring mama. And, also, I know that for so many reasons, I’m a better mom because I’m a working mom. To be fair though, my mother-in-law and husband take care of our son at home. So he hasn’t had to do daycare. I know from friends what a stress that can be and wish you luck! Oh no! That’s horrible 😦 Here I am whining about some rug burn under Punkie’s eye and your baby broke his leg. I’ve been eying the slide at the playground lately – they’re really high up in the air now that I am looking at it with a new perspective. Thank you for the encouraging message. Most days are good. The doubt and guilt sometimes creep in when I’m not looking, but I agree with you. I would have thought a tunnel slide would be more safe because the kid can’t fall over the edge! So, I DIDN’T know that. And I doubt that all those people did too – it’s just so easy to say “I knew that” after the fact. I hope your son is better or on the way to being better now.